[144 Pages Report] The cloud orchestration market size is estimated to grow from USD 4.95 Billion in 2016 to USD 14.17 Billion by 2021, at a CAGR of 23.4%. Factors such as growing demand for optimum resources utilization, increasing need for self-service provisioning and need for flexible, agile, and cost-efficient services are fueling the growth of the market across the globe. To describe and forecast the global cloud orchestration market on the basis of solutions, services, deployment models, organization size, industry verticals, and regions. To forecast the market size of the five main regional segments, namely North America, Europe, Asia-Pacific (APAC), Middle East and Africa (MEA), and Latin America. To strategically analyze subsegments with respect to individual growth trends, future prospects, and contribution to the total market. To provide detailed information regarding the major factors influencing the growth of the market (drivers, restraints, opportunities, and challenges). To analyze the opportunities in the market for stakeholders and to provide details of competitive landscape for major players. To strategically profile key players and comprehensively analyze their core competencies and positioning. To track and analyze competitive developments such as mergers and acquisitions, new product developments, and partnerships, agreements & collaborations in the market. The cloud orchestration ecosystem comprises service providers such as IBM Corporation (Armonk, New York, U.S.); HP Enterprise Company (Palo Alto, California, U.S.); Oracle Corporation (Redwood City, California, U.S.); Cisco Systems, Inc. (San Jose, California, U.S.); Amazon Web Services (Seattle, Washington, U.S.); VMware Inc. (Palo Alto, California, U.S.); Computer Sciences Corporation (Tysons, Virginia, U.S.); Red Hat, Inc. (Raleigh, North Carolina, U.S.); ServiceNow, Inc. (Santa Clara, California, U.S.); and BMC Software (Houston, Texas, U.S.). Other stakeholders of the cloud orchestration market include cloud vendors, application design and development service providers, and network service providers. “The research study answers several questions for the stakeholders, primarily which market segments to focus in the next two to five years for prioritizing the efforts and investments”. Detailed analysis and profiling of additional market players (Up to 5). The cloud orchestration market is expected to grow from USD 4.95 Billion in 2016 to USD 14.17 Billion by 2021, at a Compound Annual Growth Rate (CAGR) of 23.4% during the forecast period. Growing demand for optimum resources utilization and increasing need for self-service provisioning has led to the increased demand for cloud orchestration services and applications. 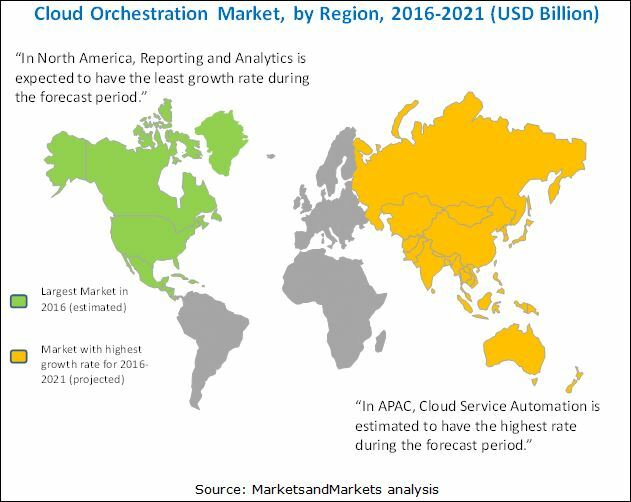 The cloud orchestration market has been segmented based on service type, application, deployment, organization size, vertical, and region. The cloud automation service is expected to grow at the highest CAGR during the forecast period, while reporting and analytics is projected to have the largest market size in 2016 in the market. Cloud orchestration services offer enterprises the flexibility to scale up or scale down the resource consumption, depending on the business requirements. The adoption of cloud orchestration services among the enterprises increased due to their benefits such as rapid deployment, increased staff efficiency, reduced cost of maintenance, improved responsiveness to end users, optimum resource utilization, and increased quality. The compliance auditing is expected to grow at the highest CAGR during the forecast period. Due to the presence of advanced technologies in the cloud orchestration market, companies are focusing on updating their orchestration systems to keep pace with their competitors. The major factors driving the adoption of cloud orchestration are high demand for resource management, improving productivity, and increasing need for self-service provisioning. The media and entertainment sector is expected to grow at the highest rate in the market during the forecast period. Media companies are implementing cloud orchestration services to automate scaling of their content creation, storage, and delivery while reducing capital investment in IT. North America is expected to have the largest market share in 2016, whereas the Asia-Pacific (APAC) region is expected to grow at the highest CAGR from 2016 to 2021, in the cloud orchestration market. Factors such as rising need for advanced resource management system and shifting of workloads to cloud environment, would also drive the demand for cloud orchestration solutions, globally. The adoption of cloud orchestration is increasing in the market owing to the growing need of automation and lowering the administrative overheads. However, enterprises face some obstacles while adopting cloud orchestration such as lack of operational and IT skills and high initial investment cost. The major vendors in the cloud orchestration market include IBM Corporation (Armonk, New York, U.S.); HP Enterprise Company (Palo Alto, California, U.S.); Oracle Corporation (Redwood City, California, U.S.); Cisco Systems, Inc. (San Jose, California, U.S.); Amazon Web Services (Seattle, Washington, U.S.); VMware Inc. (Palo Alto, California, U.S.); Computer Sciences Corporation (Tysons, Virginia, U.S.); Red Hat, Inc. (Raleigh, North Carolina, U.S.); ServiceNow, Inc. (Santa Clara, California, U.S.); and BMC Software (Houston, Texas, U.S.). These players have adopted various strategies such as new product development, mergers and acquisitions, collaborations, and partnerships to cater to the cloud orchestration market.